Hidden in the mountains northeast of Marrakech lies a system of fertile valleys winding along the base of the Middle Atlas Mountains. 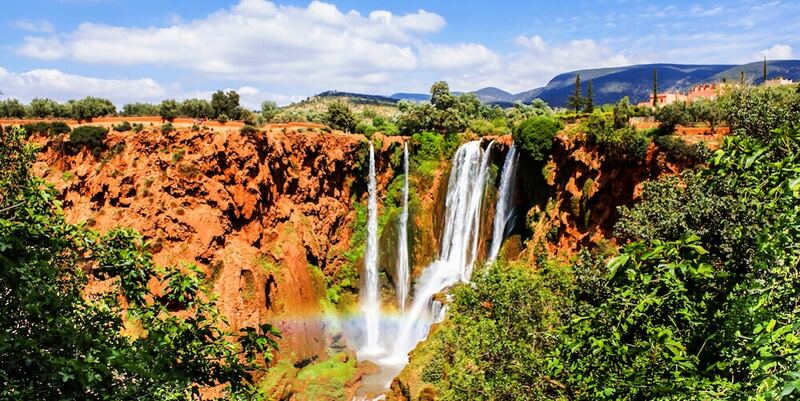 The river that feeds the village of Ouzoud makes a sudden drop of more than 300 feet creating one of the most beautiful waterfalls in Morocco! 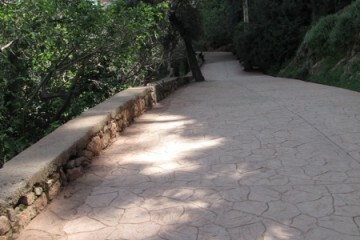 A path has been built from the top of the falls and winds down to its base. It is lined with typical tourist shops as well as cafés serving drinks and tagines. There are several places to stop and view the waterfall or snap pictures of the many monkeys that live there. This activity has PARTIAL/LIMITED wheelchair access. 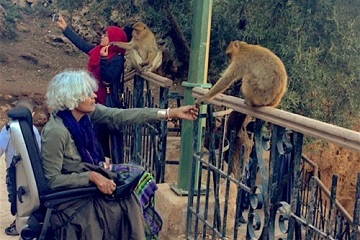 The first portion of the path to see Ouzoud Falls is free of steps making it accessible for visitors with limited mobility and travelers in wheelchairs. If you stop at the end of the accessible path, you will be able to see the water falls, visit some of the shops that line the path and sit in the shade of the trees for lunch. For a descent to the end of a walkway, we recommend a manual wheelchair and an assistant for the return ascent. Beyond this the walkway begins to take several steps down to a level plane and again a long series of steeper steps to the base of the falls. Descending to the base of the waterfalls would be very difficult for anyone with limited mobility or for someone in a wheelchair and the return ascent is difficult for all. However, the top portion of the falls is fully accessible – as well as spectacular! This excursion is approximately 7-8 hours long. 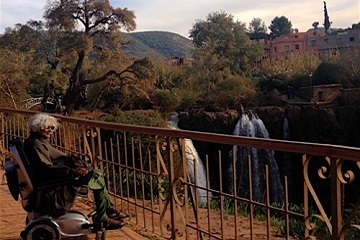 This includes driving times, exploration at Ouzoud Falls and lunch. Let’s get in touch – tell us a bit more about your desires for your trip to Morocco! We are excited to start creating with you! Just wrapped up a wonderful five days in Morocco with three days in Marrakech arranged by Morocco Accessible Travel – highly recommended!